The new Fujifilm XF 16mm F2.8 R WR is a great addition to the three other compact XF lenses - the 23mm, 35mm and 50mm F2 - making for a great collection of small, high quality primes that cover an effective 24-75mm focal length in 35mm full-frame terminology. Offering a wide-angle focal length, close-focusing distance of 17cms, fast maximum aperture and weather-proofing in such a small, discrete package makes the XF 16mm F2.8 R WR very well-suited to street, reportage and low-light photography. Optically it's an excellent lens too, with virtually nothing to complain about, and the modest asking price makes it something of a bargain even at the full RRP. The Fujifilm XF 16mm F2.8 R WR lens is tack-sharp in the image centre throughout the entire aperture range (with the exception of f/22), and the edges are very good from f/5.6 onwards. The fast maximum aperture of f/2.8 and the circular 9-blade aperture make it fairly easy to creatively throw the background out of focus, although the much faster XF 16mm F1.4 is obviously better in this regard. Vignetting is almost a non-issue and chromatic aberrations are very well-controlled. 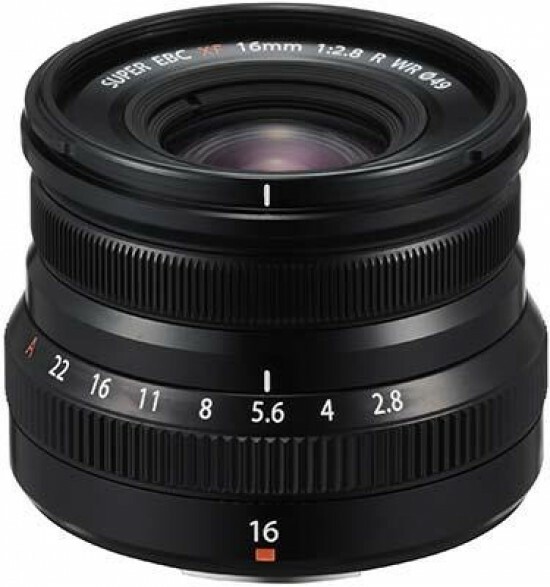 The auto-focus system in the Fujifilm XF 16mm F2.8 R WR is fast, accurate and quiet, and despite its compact dimensions, it still offers a very welcome aperture ring which makes it quick, easy and precise to set this key element of exposure. The lens mount is made of metal and, thanks to an internal focusing (IF) system, the front element and filter thread do not rotate on focus, which is very good news for those using polarisers and ND grads on a regular basis. Even the petal-shaped hood that's supplied with the lens is of good quality, helping to avoid flare when shooting directly into the sun. Overall, there's very little to complain about and lots to like with the new Fujifilm XF 16mm F2.8 R WR. If you don't want to stretch to the bigger and more expensive XF 16mm F1.4 R WR lens, then this new member of the X-series lens range is well worth a look.